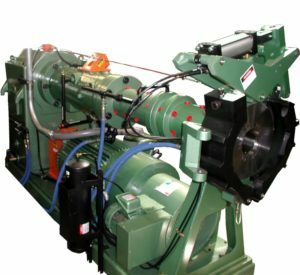 NFM fully understands that when it comes down to meeting your customers’ demanding rubber extrusion expectations, reliability in machine design and service is absolutely critical.  NFM and its wholly owned European subsidiary, NFM IDDON, are industry leaders in the design and manufacture of rubber extruder systems. 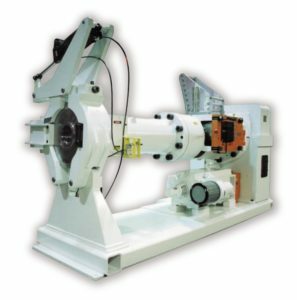 With more than 100 combined years of experience serving the global rubber marketplace, each HRX Single-Screw rubber extruder is custom-designed and engineered to provide enhanced productivity and ease of maintenance. Hot Boxes available with infrared or radiant high intensity heating to initiate cure. Horizontal or Vertical orientations. Various motor/drive classifications are available depending upon your application and environment. Motor sizing is based on the specific energy and max screw rpm selected for your product or the extruder maximum allowable HP (Kw). Unless otherwise specified the motor is targeted to operate at ≤~80% full load while producing the targeted rate. Motors available in vertically stacked “tuck-under” design (shown), in-line or parallel configurations. Direct coupled, lubricated design featuring a split cast aluminum cover allowing grid replacement without movement of the motor and gearbox. Gearbox reduction gear sets based on your application. Thrust bearing mounted in front of the gear reducer. The smooth running, low noise level meets OSHA standards. 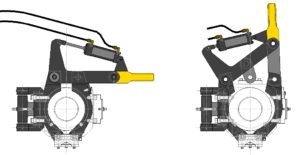 The gearbox is lubricated by an external pump and has a heat exchanger which provides cooling at high speeds. Compounds are fed into the extruder assisted by the direct-driven Power Feed Roll and spiral undercut feed liner. Feed hopper includes guard with rollers on top entrance or can be configured to allow feeding from either side. Hardened steel scraper with hinged door assembly allows for easy access for cleaning and inspection. Welded and flanged to the feed section, cylinder barrels are typical one- or two-piece assemblies with removable bimetallic liners. Most barrel liners are interference fit with metallurgy to best suit your application and rubber compound. Typical material selection include bi-metallic materials such as nickel-boron or tungsten carbide. Barrels are outfitted with safety rupture disc and instrumentation ports for monitoring and control of your process. Screws can include removable noses and can be cored for cooling via rotary union. Base/Root Materials: A wide variety of Alloy Steels, Stainless Steels, and Tool Steels can be used depending on your requirements. Flight Materials: NFM can apply screw flight treatments and hard facing across the full width of the flight (not a simple inlay). These options include: flame hardening, nitrided, nickel cobolts, nickel chromium borides, tungsten carbides, and many others. Screw Plating: Chrome and nickel plating are common though NFM has the capabilities to apply many types of surface treatments to enhance the performance and life of your feed screw. 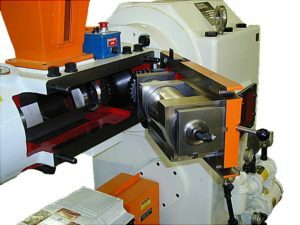 NFM’s clamping systems come in many styles for quick and easy access to the front of the machine. Clamps are designed for up to 65 MPa (10,000 psi) of discharge pressure and can be manually operated or hydraulically controlled. Click here for more information on NFM’s Clamping Systems. 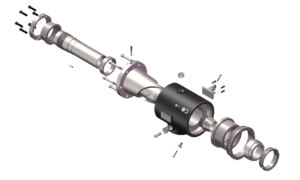 The HRX-II-P Pin Barrel Extruders offer an innovative modular door design for improved feeding of compounds and less trailings. 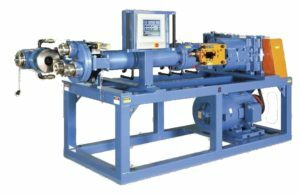 Optional variable speed feed-roll assemblies on the HRX-II-P offer uniform feeding, which eliminates the coupling gear and requires less maintenance. 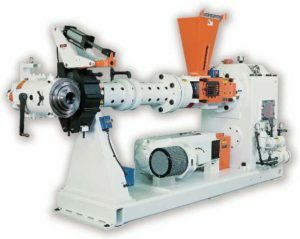 HRX-II smooth-bore extruders are cold-feed rubber extruders that provide lower porosity in continuous-cured rubber extrusions. Integral or jacketed barrel passages for thermal fluid circulation provide superior heat transfer for temperature & process control. Screw Designs are custom engineered and tailored to meet your production and process requirements for a wide range of materials. NFM’s Silcure Silicone Extruders are especially designed for the extrusion and curing of silicone rubber profiles, hoses, and wire insulation. Extruders ranging from 38mm to 90mm feature highly efficient cooling for the most heat sensitive polymers. The unique screw designs and precise drive control ensures exact output stability across a wide range of screw speeds. “Hot Boxes” provide high intensity heating to initiate the cure. These units utilize the latest in infrared or radiant heat technology. Operating temperatures in excess of 800°C can be attained via multi-zone heating. The correct balance of heat can be applied about the most complicated profiles. Hot Boxes can be mounted horizontally or vertically depending on your process requirements. The use of a Hot Box may provide sufficient cure for small profiles without the use of extension ovens. For larger profiles, Hot Boxes can be used to cure the outside of the profile to maintain its shape as it transfers through extension ovens. “Extension Tunnels” are utilized to maintain the cure temperature without overheating the product. Horizontal and vertical units are available with a range of features including PTFE coated or stainless steel belts, automatic tensioning and tracking systems. *Output rates are estimated. Actual output rates dependent on material properties and processing conditions.